I stood amazed on this hot, hot evening. It was deathly still, not a breath of a breeze and still over 80 at almost 7:00 p.m. But there was a lovely array of clouds in the evening sky and the sun was having fun playing peek-a-boo as it set. 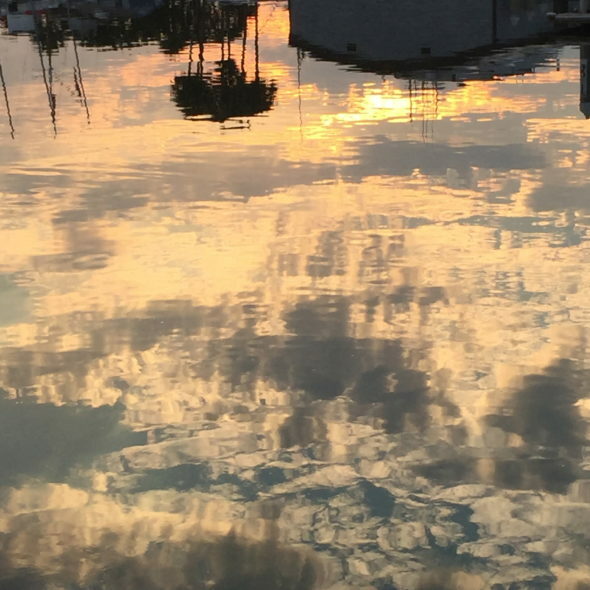 This is not a direct picture of the sky, but a shot of the water in the marina, reflecting that sky. And it took my breath away. Light is amazing — it opens our eyes to see things we could not otherwise see, both positive and negative. It showcases dust in the corners as often as it points us toward hidden beauty in the shadows. Yet both functions are important, are they not? We need to see the beauties all around us. And we need to see the stuff that needs cleaning up, too. There’s been a lot of both heat and light in the news of late — sexual predation, political braggadocio, intrigue, mistruths, half-truths . . . the spotlight is a good and necessary thing when it helps us to see things as they are and maybe even hints at what they might be. Hopefully, as we learn more and more about the things-that-happen-in-the-dark, we’ll commit ourselves to be people who choose the light, the truth. Maybe we can use a little of that light to show us where to clean house. And where to sing out loud praises for goodness ongoing. Diana, your post here speaks loudly to me. As we live in a forest, we have very little direct light. However, there are those times when the sun shines through a window or a skylight, and I go, “Oh, no!” Where did that cobweb come from? How did that dust build up? Why don’t I see it day to day? So thankful for the light that shines and shares the areas of my life that have dwelt too long in darkness. I hear you, Martha! It’s amazing what a little light can find, isn’t it?? Sheesh!